LAS VEGAS (AP) — Las Vegas-based casino company MGM Resorts International has announced a first phase of layoffs in a cost-cutting operational shift as it aims to boost earnings. LAS VEGAS (AP) — Records say a woman injured in a fall from a Las Vegas casino roller coaster last month was a "double amputee" before getting on the ride. LAS VEGAS (AP) — Officials say a woman was injured after she fell from a roller coaster in the Adventuredome amusement park at the Circus Circus hotel and casino on the Las Vegas Strip. LAS VEGAS (AP) — MGM Resorts International has been authorized to continue operating casinos in the Chinese gambling enclave of Macau. LAS VEGAS (AP) — Former Nevada Gov. Brian Sandoval is joining casino giant MGM Resorts International to help push the company's global expansion efforts, particularly in Japan, and work on state-level public policy related to sports betting. LAS VEGAS (AP) — Britney Spears is putting her planned Las Vegas residency on hold to focus on her father's recovery from a life-threatening illness. LAS VEGAS (AP) — A Nevada jury awarded about $524,000 to a California man who sought millions of dollars for injuries he said he suffered when a temporary sign collapsed atop him at a Las Vegas Strip hotel. Glenn Richardson's attorney, Adam Breeden, said Tuesday he intends to appeal the Clark County District Court civil jury verdict, delivered Monday. Breeden acknowledged that attorneys for the Mandalay Bay resort had offered a $2.5 million pretrial settlement of Richardson's negligence claim. EAST RUTHERFORD, N.J. (AP) — An airplane banner criticizing the New York Jets' gaming deal partnership with casino operator MGM Resorts International circled MetLife Stadium several times a few hours before the team's game against the Buffalo Bills. Many others, surely, will be scrambling to pay the rent next month after their can't-miss bets somehow missed. LAS VEGAS (AP) _ MGM Resorts International (MGM) on Tuesday reported third-quarter earnings of $142.9 million. The Las Vegas-based company said it had profit of 26 cents per share. Earnings, adjusted for non-recurring gains, came to 24 cents per share. The results exceeded Wall Street expectations. The average estimate of five analysts surveyed by Zacks Investment Research was for earnings of 18 cents per share. LAS VEGAS (AP) — Casino giant MGM Resorts International is entering settlement talks with plaintiffs who allege negligence led to the deadliest mass shooting in modern U.S. history on the Las Vegas Strip. NEW LONDON, Conn. (AP) — A new court filing claims the U.S. Department of Interior "buckled under undue political pressure" in failing to act on an amended gambling agreement between the state of Connecticut and a federally recognized American Indian tribe. The Day reports the state and the Mashantucket Pequot Tribe made the claim in a court filing Wednesday as they seek to amend their lawsuit against the Interior. LAS VEGAS (AP) — Britney Spears will return to Las Vegas with a new residency next year. LAS VEGAS (AP) — A panel of federal judges on Wednesday denied a request from casino operator MGM Resorts International to centralize 13 lawsuits stemming from last year's mass shooting in Las Vegas. LAS VEGAS (AP) — A U.S. judge said Friday he wants more documents and testimony about jurisdiction questions before deciding if negligence lawsuits stemming from the Las Vegas Strip massacre should be heard in state or federal court. CEO Mike Jackson is departing after almost two decades leading the nation's largest auto dealership chain. LAS VEGAS (AP) — Law enforcement authorities are looking for an armed man who robbed a casino-resort on the Las Vegas Strip. LAS VEGAS (AP) — Stadiums, corporate buildings and other facilities that draw crowds have strengthened their security since 9/11, and in return, they have earned U.S. protections in the event their efforts fail to prevent a terrorist attack and they are sued. But hotels have not received the same safeguards. ATLANTIC CITY, N.J. (AP) — Atlantic City's Borgata casino has begun taking sports bets via mobile phones. LAS VEGAS (AP) — As revenue goes it barely registers on the books. 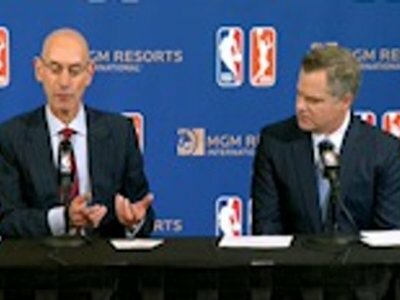 The NBA probably gets more from the contract with its frozen daiquiri vendor than it does the new deal it inked with casino giant MGM Resorts International. With good reason. The deal announced with such fanfare Tuesday is arguably little more than a branding exercise — at least for now — and a chance to take baby steps into a sports betting partnership that would have been almost scandalous only a few years ago. LAS VEGAS (AP) — The unprecedented move from MGM Resorts International to sue hundreds of victims of last year's mass shooting in Las Vegas using an obscure U.S. law never tested in court has been framed by the casino-operator as an effort to avoid years of costly litigation — but the legal maneuver may not play out that way. LAS VEGAS (AP) — No events have been canceled at the convention center in the Mandalay Bay casino-resort in Las Vegas that flooded Tuesday because of a water main break. MGM Resorts International spokesman Brian Ahern says the convention center "is proceeding with its normal events and operations schedule Wednesday." The break dumped water onto the first floor of the convention area Tuesday evening, and about a thousand people on the second floor had to be relocated. Housekeepers, bartenders, cooks, bellmen and other unionized workers of casino-resorts operated by MGM Resorts International in Las Vegas have approved a new contract. A vote to ratify the five-year agreement Tuesday put an end the possibility of a strike at those properties. LAS VEGAS (AP) — Fire department officials say crews had to rescue guests of a Las Vegas Strip casino-hotel after a power outage left them stuck in elevators. The Clark County Fire Department says crews responded to the Circus Circus casino-hotel after receiving a report of a power outage around 8:20 p.m. Friday. The department says crews got everyone out of the elevators by 9:15 p.m. Power was restored about 15 minutes later. SPRINGFIELD, Mass. (AP) — A Massachusetts casino has been approved to serve alcohol into the wee hours of the morning. MassLive.com reports the Springfield City Council approved a proposal Monday to extend alcohol serving hours at MGM Springfield until 4 a.m. at the casino. Drinks will be served in different cups between 2 to 4 a.m. and only accessible by customers engaged in gaming. LAS VEGAS (AP) — A union for Las Vegas casino-hotel workers is shifting its attention to negotiating contracts with smaller casino operators after reaching tentative labor agreements with two companies that employ most of the 50,000 employees threatening the first citywide strike in more than three decades. A union for casino-hotel workers says it has reached a tentative agreement with MGM Resorts International, covering nearly half of the 50,000 employees threatening to strike in Las Vegas. LAS VEGAS (AP) — The two largest resort operators in Las Vegas would lose more than $10 million a day combined if housekeepers, cooks and others go on strike, a possibility starting Friday, the union representing thousands of casino workers said Wednesday.